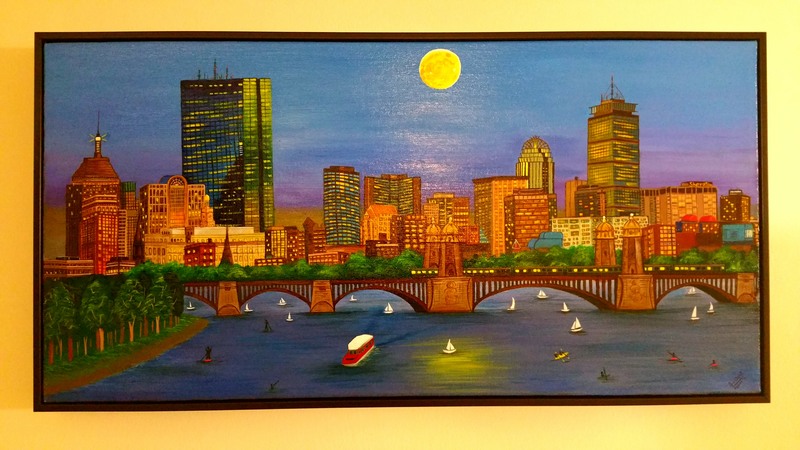 My latest painting of Boston Skyline. Many of us already have the sweet memory of how exactly we felt when we achieved our dream. But how about that experience when you make someone’s dream come true for whom you are most special on the earth . The almighty has given me that opportunity. My husband had a wish to have a cityscape painting that will reflect an actual existing city Skyline. Mostly the city scape paintings we see are done mainly using black color and they miss the details. So I promised him that I will honestly try my level best to paint a city Skyline where I will show all possible details and the beauty of night lights but without using black color. So, I literally put myself in a challenge to bring out the depth of the color contrast specially when I am doing a night scenario. To start with, the first thing I needed was a reference photo. My husband did that job. He captured lots of photos of his dream city’s Skyline from many different locations. For that he took some memberships just to get a perfect view. Then I did the sketch. But to meet up my promise (for coloring) I need to pick up a perfect time of a day when it will be evening but still brightness everywhere (because I can’t use black color). One day, when I was returning from my gallery meeting I saw exactly what I was searching for. …a bright full moon evening with a clear sky… where all building lights were on and we could able to see the building’s actual color. That was God’s way to show me the path. So, here in my this Boston Skyline painting I showed all THIRTY SIX buildings with their actual colors along with the night lights beauty and a bright full moon shining on the blue clear sky. Finally with God’s blessing I am able to fulfill my special one’s dream. I got my prove when I saw a drop of tear on his face and smile from his heart. Thank you so much for taking your time and reading the whole story.